Bryce Cofield took off for New York City in 2009 almost before the ink was dry on his diploma from Hilton Head Island High School. A familiar face on the stages of his alma mater, Main Street Youth Theatre and the Arts Center of Coastal Carolina, Cofield was known for his rich baritone voice and his seemingly natural acting abilities. In New York, he attended the American Musical and Dramatic Academy, where he continued to practice his craft. He took acting, vocal and dance classes back to back, with no summer break, and finished in one year, graduating in 2010. Since then, he has continued to live in New York, auditioning as much as any actor looking for a break. He has had some success and last year was cast in Reefer Madness at the Times Square Art Center. Most recently, Cofield worked with director Philip Seymour Hoffman, running lights and sound for A Family For All Occasions with the Labyrinth Theatre Company at the Bank Street Theater. “It was the confidence in performing that I gained here, on local stages, that got me those jobs,” he said. 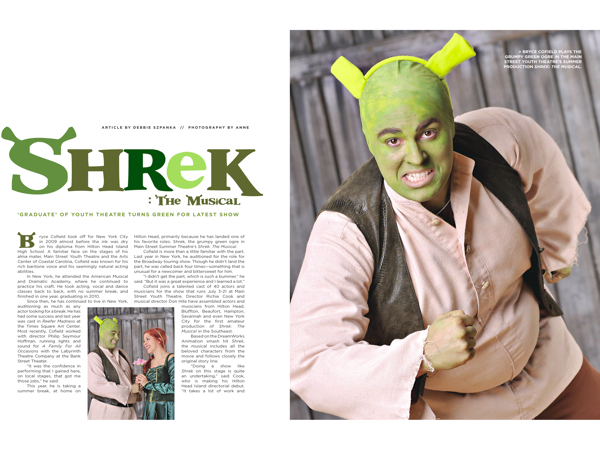 This year, he is taking a summer break, at home on Hilton Head, primarily because he has landed one of his favorite roles: Shrek, the grumpy green ogre in Main Street Summer Theatre’s Shrek: The Musical. Cofield is more than a little familiar with the part. Last year in New York, he auditioned for the role for the Broadway touring show. Though he didn’t land the part, he was called back four times—something that is unusual for a newcomer and bittersweet for him. Cofield joins a talented cast of 40 actors and musicians from Hilton Head, Bluffton, Beaufort, Hampton and Savannah for the show that runs July 3-21 at Main Street. 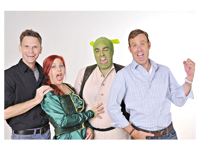 Director Richie Cook and musical director Don Hite have assembled actors and musicians from Hilton Head, Bluffton, Beaufort, Hampton, Savannah and even New York City for the first amateur production of Shrek: The Musical in the Southeast. Based on the DreamWorks Animation smash hit Shrek, the musical includes all the beloved characters from the movie and follows closely the original story line. Cook is chair of the Fine Arts program at St. Andrews School in Savannah. Hite is familiar locally as a producer and musical director of stage shows since the late 1980s. The two worked together earlier this year on Little Shop of Horrors at Savannah Children’s Theatre. 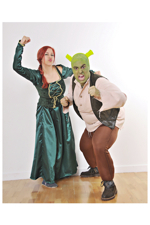 Shrek: The Musical opens July 3 with a gala fundraiser, featuring delectable treats from NEO, beverages and entertainment for adults and children. Shrek himself will entertain children by reading “his” storybook and offering Green Ogre Slushies. The show continues Wednesday-Sunday through July 21. There is no show July 4. Tickets for the gala are $50 for adults and $25 for children. Regular tickets are $25 for adults and $15 for students and children. msyt.org. Main Street Summer Theatre is located at 3000 Main St.